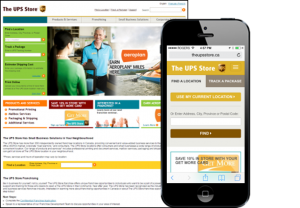 The UPS Store Canada Teams with Reshift Media on Responsive Website | Reshift Media Inc.
(TORONTO) April 25, 2016 – The UPS Store Canada has teamed up with Reshift Media for a complete redesign of their website www.TheUPSstore.ca. As Canada’s largest chain of print and copy centres, the UPS Store Canada features a network of over 360 independently owned and franchised locations. They cater to small businesses, home offices and busy consumers by offering one-stop shop for printing, copying, packaging and shipping. The UPS Store Canada first teamed up with Reshift Media to create a mobile-friendly website in May 2013. 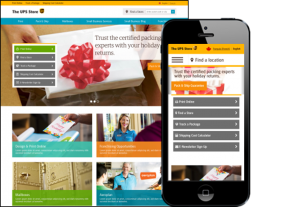 Within six months, The UPS Store Canada saw a 417% increase in organic mobile and tablet sessions on their website. In the three years since that relaunch, The UPS Store Canada has continued to see an evolution in the way customers use their website, and needed a fully responsive website to take advantage of the latest changes in mobile use and search rankings. Reshift Media Inc. is a digital marketing agency that works with companies worldwide to redesign and redevelop web/mobile sites, conceive and execute innovative social media approaches and implement leading-edge search engine strategies. For more information, please visit www.reshiftmedia.com or contact Jen McDonnell at jmcdonnell@reshiftmedia.com. With over 360 franchised locations, The UPS Store is Canada’s largest network of print and copy centres. The UPS Store offers complete business support services such as digital colour and black and white printing, full document finishing, worldwide shipping and packaging services, mailbox rentals with 24-hour access, mail forwarding, package/mail and fax receiving, and mail fulfillment. The UPS Store operations in Canada are owned and managed by Oakville, Ontario- based MBEC Communications Inc. The UPS Store name is used in Canada under a master license by The UPS Store, Inc., a UPS company. For more information, please visit www.theupsstore.ca or contact Michelle Cameron at mcameron@theupsstore.ca. Social Media Manager. Jim has over a decade of experience in digital communications and has worked in a varied number of industries, from sports media to diamonds.